The economist Theodore Levitt wrote “The purpose of any business is to create and keep a customer”. Since I am advertising Customer Service (both the discipline and the product), I am particularly interested in the “keep”-part in that phrase. I believe keeping your customers is key to any business these days, and I appreciate so much more to deal with people who understand that, rather than ship-and-run sales people. In fact, purchasing products and services from businesses which treat me really well, is …well… a treat. As you can see, a drop from “Very satisfied” to “Somewhat satisfied” results in a 43 percentage points drop in loyalty! In other words, if we want our customers to stick around (and shop more), we need to keep them happy. 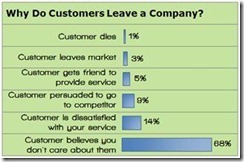 Now, this raises the question of what it takes to keep the customer satisfaction up. Clearly, there is no simple answer to this question. Customer satisfaction is linked to the whole customer experience, which is a result of our products or services, prices, image, marketing, box wrapping and the color of our logo. But of course, I will argue that good customer service is a central element in this mix. Earlier this year, I was attending a “Best customer service”-award event. The overall winner was a local airline company, and the head of customer service gave a presentation of how they were working. I especially noted one point he made. They had done surveys on the customers to measure their level of satisfaction. Amongst the customers who had not experienced any serious problems (canceled flight, lost luggage, etc), the customer satisfaction index (CSI) was 70. However, the customers who had experienced such a problem, but then been well treated by the customer service department, reported a CSI of 77! In other words, the customers who had gotten their flight delayed ended up being more satisfied than before, simply because they felt they were taken well care of. (The ones who did not get proper service fell to a CSI of 50). I believe Theodore Levitt’s words are just as valid today as in 1980 when he wrote them, however the growth of the internet has changed the picture a bit. It is now very simple for customers to communicate with businesses, as well as other customers. 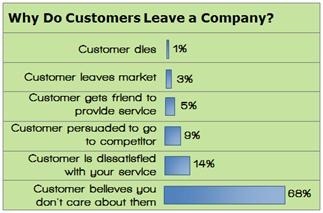 Keeping your customers is even more important today, because if they feel ill-treated, they will not only leave you, but also tell everyone else about it. On the flip side of that coin lays the possibility of quickly and efficiently communicating with your customers, offering them that extra attention, resulting in them becoming loyal ambassadors. Ever since working at the support desk of an internet service provider in the 90s, I have been above average interested in customer service and support processes. As the product manager and one of the developers behind our product, SuperOffice Customer Service (formely eJournal RMS), I am continuously looking at how businesses can offer great customer experiences and how our software can help them doing so. Dr. Theodore Levitt’s concept that the function of a business is to get and keep customers is spot-on. If you ask the average person what the function or purpose of a business is, he/she will typically say to make money. That is actually the goal of the business. If you confuse the function (getting and keeping customers) with the goal (making money), you may not reach your goal.